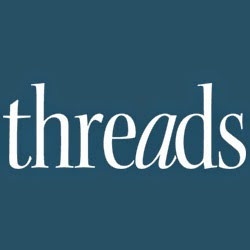 The April/May 2004 issue of Threads magazine (#112) marks the debut of a brand-new feature, Fabrications, which will appear in each issue. For these articles, Threads editors select a single pattern and ask three designers (or ordinary sewers) to leave the pattern envelope image behind and dream up new ways to pair the pattern with fabric. 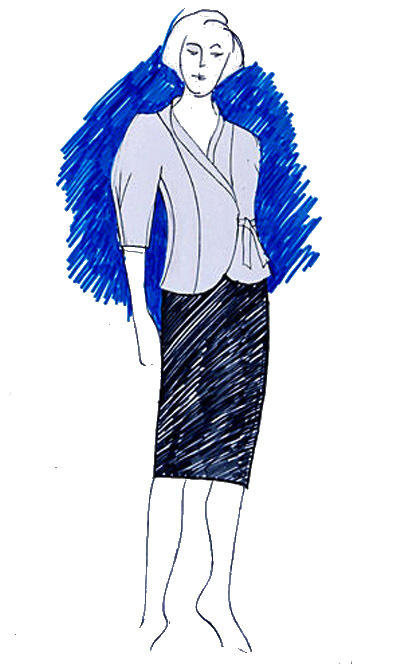 The pattern’s basic shape must not be altered, although hems can be raised or lowered, and sleeves, collars, and applied details such as pockets omitted (but not added). Any trims, surface design, or construction techniques are fair game. 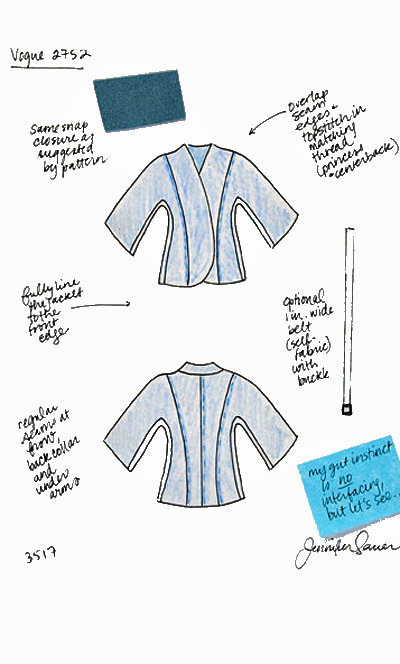 In the first installment of Fabrications, editors Judith Neukam, Jennifer Sauer, and Carol Fresia all fell in love with a Guy Laroche jacket design (Vogue 2752), and brainstormed ideas for turning this asymmetrical, tailored garment into…something different. Interestingly, we had no trouble coming up with three unique takes on this deceptively simple garment. With some general ideas in our heads to start with, we shopped for fabric, trims, buttons, and anything else our individual iterations might require. 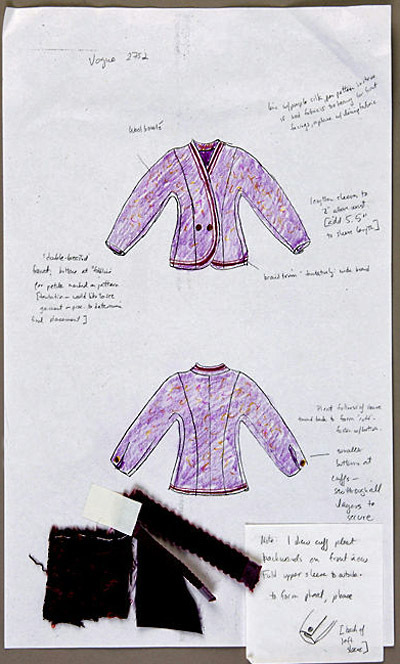 Each editor drew up a fashion sketch and a schematic view of her garment design to guide Norma through the sewing process. Once we’d purchased our fabric treasures, we drew up spec sheets, which consisted of a sketch based on the photo on the pattern envelope (if you want to learn more about this shortcut to fashion sketching, check out “Fashion Sketching for Untrained Artists,” in Threads #105; you can also print out a copy of the Threads croquis), fabric swatches, and indications of any minor changes to the pattern our designs would require. 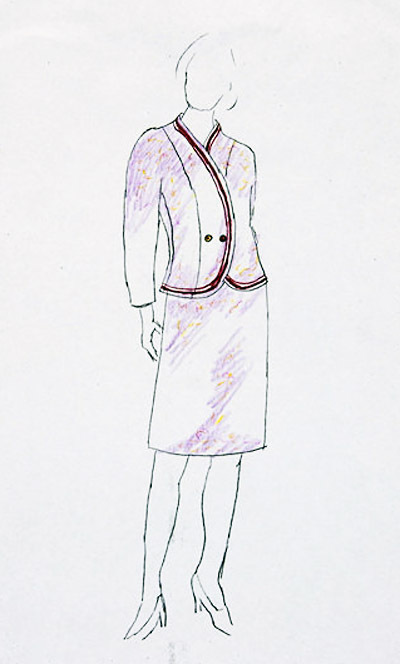 Although we would have loved to sew up the garments ourselves, we delegated that task to a local dressmaker, Norma Bucko, who is a member of the Professional Association of Custom Clothiers (www.paccprofessionals.org). Norma met with us to talk over our spec sheets and get a feel for the fabric, then went off with all the goodies to work her magic. A couple of weeks later, she returned for a brief fitting, giving us an opportunity to make final decisions about the placement of trims and buttons, and to get excited all over again about “our” garments. 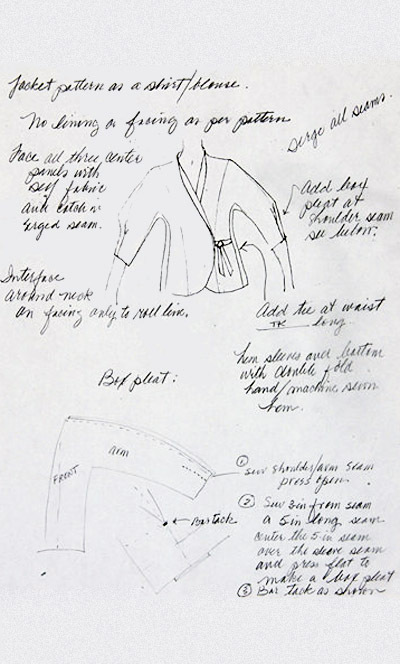 During the sewing process, Norma jotted down copious notes about her experiences working with the pattern and the different fabrics we’d selected; her pointers are printed in the article to help anyone interested in duplicating the garments as shown. 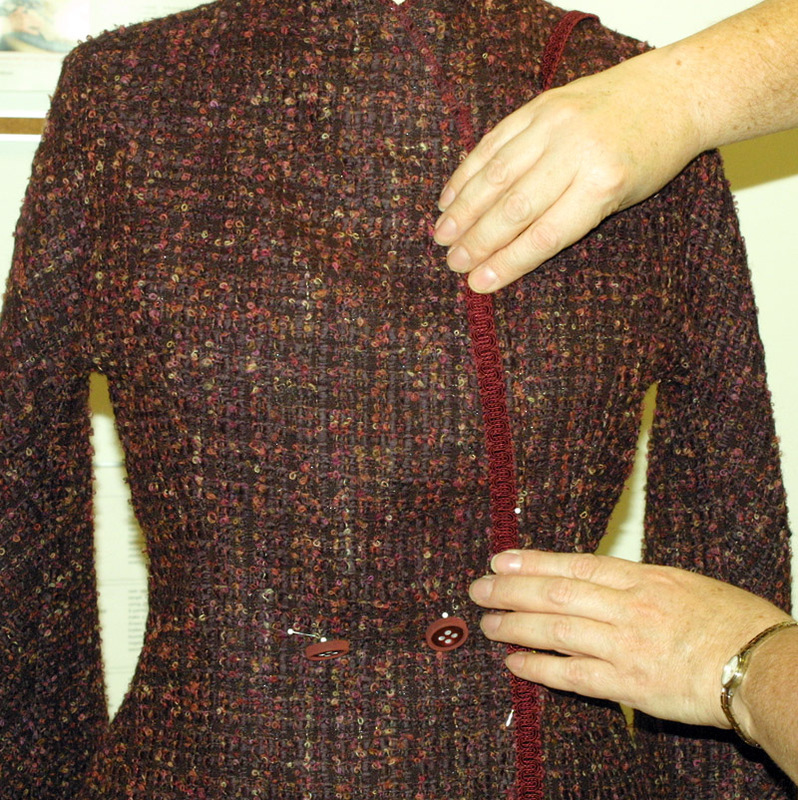 Dressmaker Norma Bucko brought in a partially completed jacket so she and Carol could make final decisions about the trim and button placement. We decided that two rows of narrow trim were more proportional than one row of wider trim. Norma also discovered that Carol’s plan to pleat faux cuffs into the sleeve hems wouldn’t work on the bell-shaped sleeve, so we left the sleeves flared, though 5 inches longer than the original pattern. 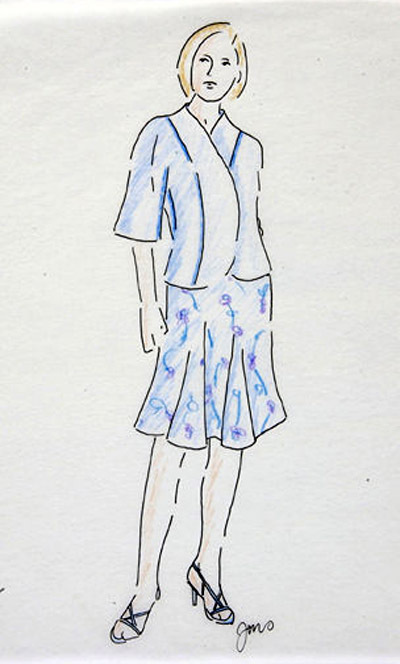 When Norma returned with the finished clothes, we were thrilled by the clear evidence that one pattern can, with only minor changes, be used to create several completely different wardrobe pieces. However, since the garments were all made in a standard “model” size, we had to face up to the reality that we editors were never going to get to wear them ourselves. We’re slightly dejected, but that hasn’t stopped us from dreaming up reasons to need these great-looking clothes, and we’ve bought out our local Jo-Ann’s entire stock of this pattern in anticipation of making our very own Fabrications jackets. 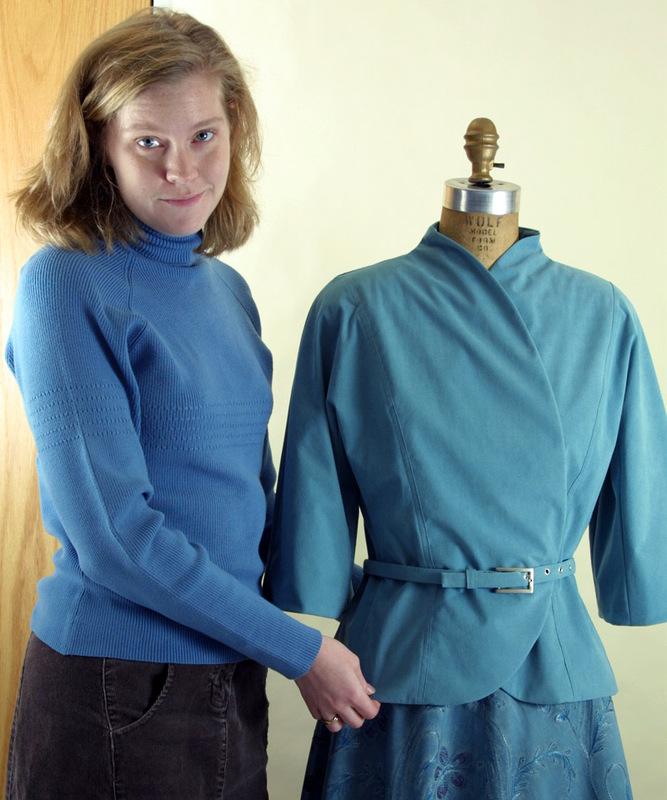 Jennifer Sauer with her Ultrasuede version of the Laroche jacket. A flared skirt of embroidered silk completes the ensemble. Judith Neukam converted the jacket into a classic white overblouse, folding back its asymmetrical wrapped front to create a shawl collar. 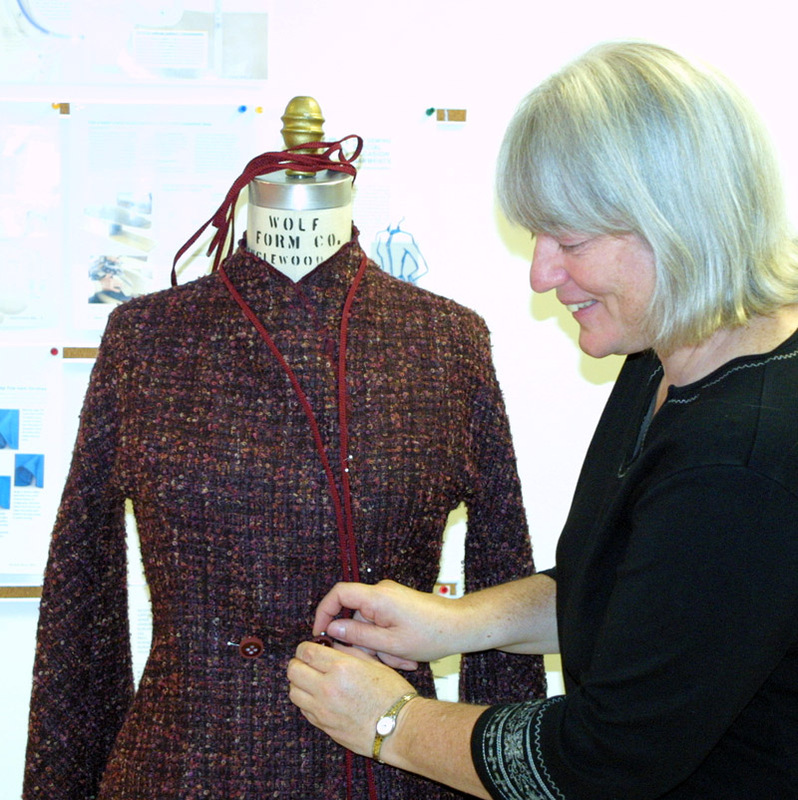 She also asked Norma to stitch a box pleat into the sleeve hem to narrow the opening. Art director Karen Meyer couldn’t resist trying on Judith’s design. Carol Fresia is an associate editor of Threads. i want to make the dancer's sweater from the august/september 2005 issue but can't find all the pages, is there any way to get the missing page i need? i thing its page 52 i have page 53. I love this idea/feature. I am always encouraging my students to expand their creativity with a familiar pattern and will be so pleased to share this article with them. My only question is how can I get involved? I would love to be a designer/ordinary sewer if you are looking for help with this feature.